Advocate staff photo by JOHN McCUSKER -- Surrounded by those who had lobbied for a smoking ban at city bars and casinos, Mayor Mitch Landrieu signed the ordinance into law Friday, January 30, 2015 at City Hall. 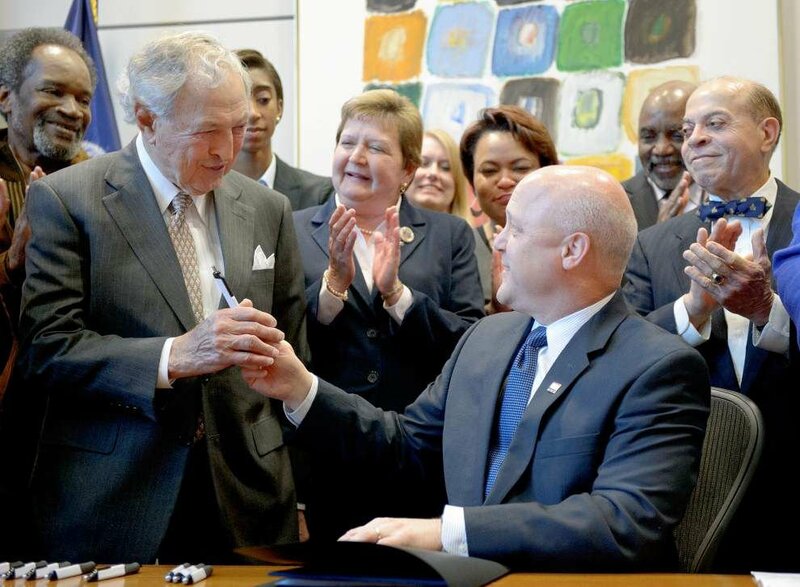 Here he shares a pen with Dr. John Ochsner, Sr. Musicians union president Deacon John Moore is right. Advocate staff photo by JOHN McCUSKER -- Gayle and Tom Benson, owners of the New Orleans Saints and Pelicans made a $20 MILLION donation to Ochsner at the cancer center that bears their name Tuesday, November 10, 2015. Dr. John Ochsner is right. Photo provided by World Trade Center of New Orleans -- From left are Dr. John Ochsner, past president of the World Trade Center of New Orleans; Bobby C. Brannon, past president of the World Trade Center of New Orleans; U.S. Rep. Charles W. Boustany Jr.; and Edward T. Hayes, chairman-elect of the World Trade Center of New Orleans. Dr. John Ochsner, a medical educator and pioneering cardiothoracic surgeon of international renown, died Friday in the hospital that bears his family name. He was 91. As the son of the late Dr. Alton Ochsner — one of five Tulane doctors who struck out on their own in 1941 to start a private group practice that has grown into a health care juggernaut — Dr. John Ochsner was expected to fill big shoes within the Ochsner health care system. And many colleagues say that is exactly what he did. 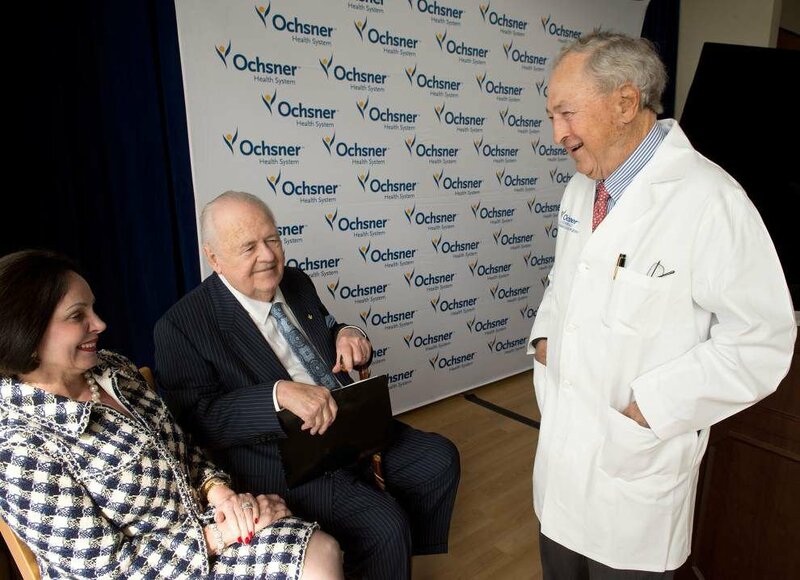 "For more than 57 years, Dr. Ochsner has been a consistent, larger-than-life presence across our hospitals and with our staff and patients," Ochsner Health System CEO Warner Thomas and board Chairman Andy Wisdom said in a statement. Although age ultimately forced Dr. John Ochsner to curtail his surgical practice, he never gave up the practice of patient care, said a friend of 50 years, H. Hunter White Jr.
No one writes the history of the Ochsner family and the medical complex bearing their name without stressing the role of Dr. Michael DeBakey, a pioneer in the development of artificial hearts and valves who, together with Dr. Denton Cooley, was the first to implant a completely artificial heart. Dr. Alton Ochsner served as an early mentor to DeBakey and helped train him in the New Orleans area. In fact, when DeBakey was a young medical student under Dr. Alton Ochsner, he babysat John Ochsner and the other Ochsner children. DeBakey, in turn, was an early mentor to Dr. John Ochsner and helped train him in Texas. He used that training to help drive the creation of a thoracic and cardiac program at Ochsner Hospital after he and his wife Mary Lou relocated from Houston to New Orleans in 1961. He notched many firsts during his years at Ochsner, including early work with valve and coronary surgery, pacemakers, and the first heart, lung and liver transplants. In 1970 Dr. John Ochsner led a surgical team that transplanted a woman’s 36-year-old heart into a 52-year-old Metairie man. It was the first such procedure in the Gulf South and among the earliest done anywhere in the world. But it would take another 20 years of research, trials and advances in tissue typing and development of immunosuppressant drugs to increase survival rates. In all, more than 950 heart transplants have been performed at Ochsner under the auspices of the John Ochsner Heart and Vascular Institute. In 2000, Dr. John Ochsner received the Michael E. DeBakey Surgical Award, bestowed on the world’s outstanding surgeons as chosen by the DeBakey International Surgical Society. The society has given 17 awards since 1978. His father received one of the first. He authored more than 300 peer-reviewed publications and was a past president of both the International Society for Cardiovascular Surgery and the American Association of Thoracic Surgery, as well as a past chairman of the American Board of Thoracic Surgery. It has been claimed that Dr. John Ochsner was born into “medical royalty.” It is a fact, however, that he was Carnival royalty in New Orleans, where he ruled as Rex, King of Carnival, in 1990. White, who played tennis for years with Ochsner until advancing age caused them to switch to golf, said his old friend enjoyed to the hilt his reign as Rex. Survivors include his wife, Mary Lou Ochsner; two sons, Dr. John Ochsner Jr., and Frank Ochsner; two daughters, Dr. Katherine Isabel Ochsner and Joby Ochsner; a sister, Isabel Mann; and two grandchildren. Family members said plans for a celebration of Dr. John Ochsner's life will be announced soon.